The following is an interview conducted back in 2003 by Roger Stanley, then the editor of Qualified Remodeler Magazine. Roger talked with Shawn about his company’s transition into design/build remodeling. Why did you get involved in design/build remodeling? I started my remodeling business out of my home in 1991. By the spring of 1993 I was doing $500,000 per year in business and had opened an office. My main frustration was that I was working 70 to 80 hours per week. I wanted to get away from that and build a company that was self-managing – that wouldn’t require so much of my time and involvement – and one that I might someday have the option to sell. Another frustration was that I was not getting the kind of projects I wanted – kitchen remodels, large bath remodels and additions. I was sick of bidding on these jobs because my bids always seemed to be too high. And when I did get one of these jobs I didn’t always get the margin I needed. Prospects were also stealing my ideas and plans. I’d see other contractors at lumberyards and building departments with plans I had developed. How did you discover design/build? A local design professional and fellow NARI member called me in 1993. 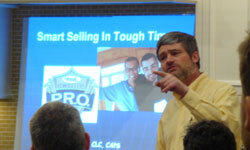 He was trying to drum up design/build work by partnering with remodelers. He got my name from another contractor. When he explained the concept of design/build – clients giving up the need to get three bids, committing to construction before the design was done and paying for design – I told him people locally would never go for it. They were used to getting free advice and bid competition. His response was that he was already working with people in the area who were doing this. I thought that if others could do it, so could I.
I began to do research and went to hear speakers talking about design/build. The appealing thing to me was that it looked like a way of doing business that facilitated my goals – eliminate competitive bidding, get better jobs and have a way of doing business that would let me delegate aspects of company operations. I did not fully realize at the time, design/build also set my company apart from most competitors. How do you define design/build? Design/Build is when the same company involved with the design of a project builds it. When remodelers successfully combine the design and construction process they provide the most efficient means possible for the homeowner to realize their project while sharing the same set of goals. The design side of either option should focus on project preparation including construction systems, specifications, and flow of information. The build aspect focuses on executing the design, and fulfilling the client's purpose for the project. If both happen in a complimentary way, the best solution typically rises to the surface. Today, we are doing in the range of $1.5 million to $1.8 million, getting the kitchen, bath and addition work we wanted, and getting our margins, which are 40 percent plus. It took time to get to this level, however. I made a commitment to move to design/build in early 1994 using a trial-and-error approach. One way we made the transition was when a prospect would come to us with plans that turned out to be incomplete or bogus. We would help show them what was missing in the plans and explain that it didn’t make sense to get bids on incomplete plans. We would then offer to finish the plans to specifications, or develop new ones, all under our design/build approach. Developing a system that worked and sticking to it. We did this by1998. At that point we were comfortable telling clients that they owned nothing in terms of plans and ideas until they signed a contract. We use a three-step design/build process to make this happen. The first step is to have the client, designer and contractor all sit down. We sell the client on the design/build process, get an idea what they want and a firm budget limit. Design can be done in-house or by an outside architect or designer, but the client pays for the design in advance. Step two is to meet with the client and show them one design option with two or three variations that meets their stated needs and budget. We have made sure the scope and budget are realistic. At this point we ask them to make up their mind whether to go ahead or not. If not, we keep the design fee. If so, they are to line up financing. In step three we present the final design with modifications based on our second meeting. At the third meeting we come with complete specs and a ready-to-sign contract. If they sign it then construction begins as soon as we have completed the final plans. Most sign the contract at that point because we have made them make real decisions in the first two steps. I should add that the transition has not ended yet because my employees are constantly evolving the process and improving it. If a company was committed and had systems, a decent transition could be done in two years. It’s not a snappy thing. What systems are needed to move to design/build? I’d start with the lead carpenter system because that is crucial to communication and keeping your promises. An estimating system and resources is also crucial because the budget determines the design. And you need paperwork that makes you and your clients stick to their promises. In design/build you have to be able to point out when something is beyond the existing budget and ask them what they want you to do and then shut up. The tendency is to want to quickly offer five options, but in design/build it’s about working with the client. So, it’s up to them to add to the budget they have given or to make a compromise somewhere. Were you able to use your same staff? I was fortunate to have people with the ability and willingness to learn. It’s a different way of doing business, so education is the main thing. I stimulated the learning, but they made it happen. They were also motivated because they could see this was their future, too, and that it meant doing bigger and better projects. Not everyone made the adjustment. My philosophy is not to hire, promote or give raises based on tenure with the company. I had one lead who aspired to be the production manager but it didn’t work out and he left. I hired a production manager. I also hired a salesperson that did not work out. In sales you need people who can sell an intangible – what the finished project will be rather than the number of 2x4’s used and the cost. What have been the benefits of design/build for your company? We’re doing higher end projects. We’ve eliminated bidding on larger projects. Our closing ratio is higher – nine out of 10 clients who sign a design contract with us also sign the construction contract. We’ve grown in volume and profitability. Systems mean my hours in the business are limited. Employees can make more money. And employee turnover is virtually non-existent. What changes has it meant for your clientele? Some grew along with us; some we left behind. You can’t please everyone. If you stop selling on price and start doing larger projects you are going to change your clientele. We’re now one of the highest-priced companies in our area. But that’s OK because our big thing is client satisfaction. We’re all over that. Everyone in the company has the same service mindset, which means you attract clients that compliment our team and its service. We love referrals. We used to do quality audits with number scoring but now we ask more open-ended questions. We want paragraphs rather than numbers. We want them to tell us what they think rather than check boxes. Statements can be used with permission as testimonials. And when we get good ones we paste them up for everyone to see, including prospects and clients who visit our office. And if I get a phone call that is a compliment for someone, I save it and forward it to that employee. What are the biggest misconceptions about design/build? That it’s a service versus a business. You can’t just offer it as another service option. It has to be your business. You have to make a commitment to it because it changes everything. You can’t be design/build today and bid/design tomorrow. Another is that you have to be a designer or have design capabilities. You don’t. You do have to be able to recognize and sell good design. Design can be hired out. We work with a number of design professionals. That’s smart because what one person can be the all-in-one designer for any client or any project? So we work with architects who are open to working as subcontractors, who understand the design/build system and who know what to say and what not to say in front of the client. Design/build needs to be a team approach between the client, the designer and the contractor. The process can’t be dominated by a single party. What kind of owners and companies should avoid design/build? People who are control freaks, who expect results overnight and who are an order taker versus a salesperson. You will also have trouble if you find change difficult. Some contractors like the idea of no competitive bids, but they themselves are stuck on selling low cost. If you’re a person who can’t buy something without checking out the price first in five stores, then you probably aren’t a good design/build prospect. If you buy on low price yourself, then how are you going to be able to sell others on something besides low price?